Has Daniel 11:40-45 been fulfilled? A couple of weeks earlier, we reported that Russia had moved troops within 85 kilometres of Israels border and we thought this was close! Well in the last few days, Russian troops have now moved 5 Kilometres from Israels border where they plan to stay for the long term. This news is confirmed by a number of mainstream media reports including STRATFOR intelligence who say that this move was a part of a loosely established ceasefire agreement between the US and Russia. Its a monumental step from September 2015, when we watched Russia move into Syria and setup a military base in the North-West. The troops are now stationed in the Syrian town of Quneitra opposite the Syrian-Israeli Golan border. Russian military personnel were already present there to advise Syrian Arab Army troops – however this is the first time the Russian military units have been deployed on this scale. A senior Israeli official reacted with alarm, “The agreement as it is now is very bad. It doesn’t take almost any of Israel’s security interests and it creates a disturbing reality in southern Syria. The agreement doesn’t include a single explicit word about Iran, Hezbollah or the Shi’ite militias in Syria”. The absence of any Trump-Putin commitment on this score leaves Israel fully exposed to the presence of Iranian and Hizballah forces within mortar range of its Golan border in an area supervised by their ally, the Russian military. It was this danger that galvanized Prime Minister Binyamin Netanyahu into broadcasting Israel’s total opposition to the Trump-Putin ceasefire for southwestern Syria during his visit to Paris on Monday, July 17, after his talks with President Emmanuel Macron. In an apparent bid to calm Israel’s concerns, Russian Foreign Minister Sergey Lavrov made an usual statement for a Russian diplomat: “I can guarantee that we have done everything and the US side has done everything to ensure that Israel’s security interests within this framework are fully taken into account,” he said later on Monday. Note how Russia has the responsibility of managing Iranian, Turkish and Hezbollah presence along the Golan – these are the national belligerents of Armageddon (Ezek 38 & Joel 3). How much closer does Russia need to be to Israel for us to make changes in our life that should’ve been made some time ago? (I speak for myself as much as anyone else!). How long until the next step South is taken? Last year we wrote a post explaining what could cause Russia to invade Israel. At the time, Israel’s Prime Minister had flown to Washington, and was making a desperate bid to get Obama’s support for Israeli sovereignty over the Golan Heights. Only a few weeks earlier a discovery had been made that would serve to increase tensions on the question of sovereignty over the Golan – huge oil deposits were found on the Golan Heights, and verified by an Israeli company. Yet, weeks later, Benjamin Netanyahu returned to Israel having failed to secure Obamas support. It wasnt long before the United Nations – including Russia – condemned Israels “occupation” of the Golan Heights, and around the same time, Syria asked Russia to develop their oil resources. Then, over the course of the next 6 months, the Israeli leadership became very concerned about Russian activity near the Golan. Click here for the context of the story thus far. “Prime Minister Benyamin Netanyahu will visit Moscow on Thursday, April 21 to meet with Russian President Vladimir Putin and to launch the most important battle of his political career, and one of Israel’s most decisive contests of the last 10 years: the battle over the future of the Golan Heights. DEBKAfile’s intelligence sources and its sources in Moscow report exclusively that Israel’s top political leaders and military commanders were stunned and shocked last weekend when they found out that US President Barack Obama and Russian President Vladimir Putin have agreed to support the return of the Golan to Syria. The two presidents gave their top diplomats, Secretary of State John Kerry and Foreign Minister Sergei Lavrov, the green light to include such a clause in a proposal being drafted at the Geneva conference on ending the Syrian civil war. 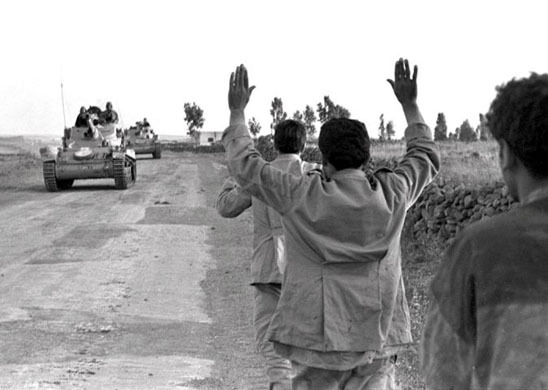 Israel captured the Golan from the Syrian army 49 years ago, during the Six-Day War in 1967 after the Syrian army invaded Israel. In 1981, during the tenure of then Prime Minister Menachem Begin, Israel passed a law defining the Golan as a territory under Israeli sovereignty. However, it did not state that the area belongs to Israel. While Israel was preparing for a diplomatic battle over the future of Jerusalem, Judea and Samaria, Obama and Putin decided to deal a diplomatic blow to Israel and Netanyahu’s government on an unexpected issue, the Golan. 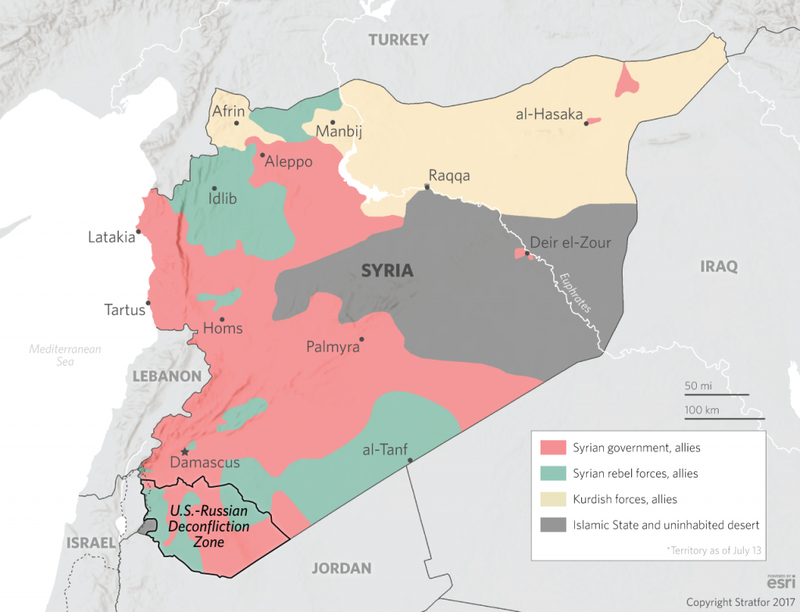 It is part of an endeavor by the two powers to use their diplomatic and military cooperation regarding Syria to impose agreements on neighboring countries, such as Israel, Turkey, Saudi Arabia and Jordan. For example, Washington and Moscow are trying to impose an agreement regarding the granting of independence to Syrian Kurds, despite Ankara’s adamant opposition. The two presidents are also pressuring Riyadh and Amman to accept the continuation of Syrian President Bashar Assad’s rule, at least for the immediate future. DEBKAfile’s sources report that just like the other diplomatic or military steps initiated by Obama and Putin in Syria, such as those for Assad’s eventual removal from power, the two powers see a resolution of the Golan issue as a gradual process that may take a long time, perhaps even years. But as far as they are concerned, Israel will have to withdraw from the Golan at the end of that process. It should be noted that Prime Minister Netanyahu is not traveling to Washington to discuss the Golan issue with Obama. The frequent trips by the prime minister, senior officials and top IDF brass to Moscow in recent months show where the winds are blowing in the Middle East. However, Moscow is not Washington, and Israel has no lobby in the Russian capital defending its interests. It should be made very clear that the frequent trips by senior Israeli officials to Moscow have not created an Israeli policy that can influence Putin or other senior members of the Russian leadership. Putin has made occasional concessions to Israel on matters of minimal strategic importance, but on diplomatic and military steps regarding Syria and Iran he has shown little consideration of Jerusalem’s stance. It should also be noted that there has been no basis for the enthusiasm over the Russian intervention in Syria shown by Netanyahu, Israeli ministers and senior IDF officers. All of the calls by a number of Russia experts, mainly those of DEBKAfile, for extreme caution in ties with Putin have fallen on deaf ears among the political leadership in Jerusalem and the IDF command in Tel Aviv. Amid these developments, three regional actors are very pleased by Washington and Moscow’s agreement to demand Israeli withdrawal from the Golan: Syrian President Assad, the Iranian leadership in Tehran and Hizballah leader Hassan Nasrallah. Now, they do not need to risk a military confrontation with Israel over the Golan because Obama and Putin have essentially agreed to do the dirty work for them. As Russia aims its heavy weapons at Turkey causing the world to watch on in suspense, a scene is playing-out between the two belligerents, one in which the world has little control. However, what many don’t realise, is that in another part of the world, seeds are being sown for the emergence of an even greater crisis. It was during the remarkable events of the Six Day war in 1967, that Israel captured the Golan Heights. 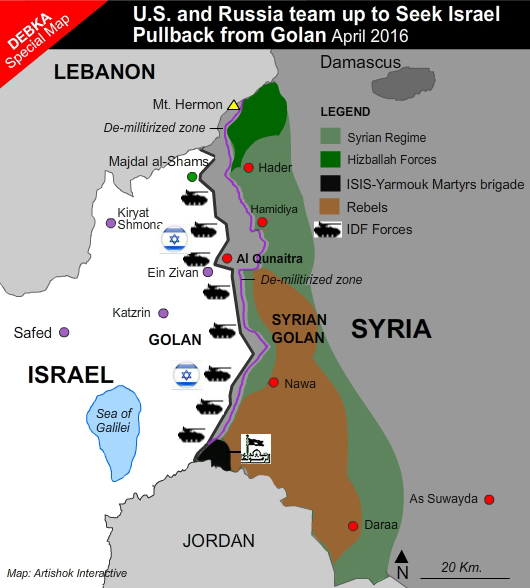 After capturing the Golan, the idea was for the Israeli government to use it as bargaining chip for any post-war negotiation, or keep it as a buffer zone to reinforce territorial security against any future Syrian aggression. Since then, continued Israeli occupation of the Golan is an arrangement which, in light of recent information, could be a latent catalyst for a Russian invasion. Its possible that in the very act of seeking security through continued occupation, Israel may have unwittingly guaranteed a future confrontation with Russia. In October, an Israeli energy company – Afek – was drilling around the Golan and discovered unprecedented amounts of oil. Just as Israel’s offshore Mediterranean gas discoveries created an entire energy industry, so the Golan oil find could transform Israel into a supplier. However, while the gas is generally recognised to be within Israeli territory, the oil discovery on the Golan is not. Since 1967, the international community of nations have only recognised Syrian ownership of the Golan. Upon publishing news of the Golan discovery, Russian state-owned media was quick to claim that “The region is internationally recognized Syrian territory”. Until recently, the dispute over Golan sovereignty was largely just a war of words: where the United Nations would pass majority supported resolutions condemning Israel for its occupation, Israel would respond by ignoring any demands to relinquish the territory. But everything changed in September 2015, when Russia moved into Syria. Russia suddenly acquired a direct and vested interest in Syrian national and geographic integrity, including, the Golan Heights. From that moment on, an intriguing series of events unfolded. Almost a month after the oil discovery, Netanyahu had a meeting planned with Obama at the White-house. As part of the meeting, Netanyahu tried to include the question of Golan occupation on the agenda, but it was rejected on the basis that the U.S. position, which objects to Israel annexing the Golan Heights, remains unchanged. A week after Netanyahu’s visit, the question of Golan occupation once again came to the fore when the United Nations voted on a resolution submitted by Syria for Israel to be removed from Golan occupation. The motion was passed with a strong majority, but most notably, the Russian Federation supported the resolution condemning Israel for its occupation. A week after re-affirming the view of the international community regarding Israels occupation, the Syrian president – Bashar al-Assad – took the opportunity to ask Russia to help develop Syrian oil resources. At this point, the focus on development is on sea based resources, however this could change if it becomes apparent that the Golan offers low cost extraction for high return. It has since come to light that the Israeli government is significantly concerned about Russian military activity near the Golan as the motives of the military are unclear. While the oil discovery rekindles the international debate on Golan sovereignty, Russia continues to support the convenient view that an Israeli occupation of the Golan is a threat to peace in the Middle East. How far will Russia go to take a spoil under the guise of achieving “peace” in the Middle East? Art thou come to take a spoil? hast thou gathered thy company to take a prey? Are ISIS the ‘Hooks in the Jaws’ spoken of by Ezekiel? Enter your email address to stay in touch with current events and news related to Bible Prophecy via email. - Who are the Christadelphians? - Dont be fooled – Putin isn’t going anywhere. Putin says ‘sorry cant help’ to Israel and invites Iran to Israels border.